The centerpiece of the memorial complex is Victory Plaza with full size statues of a mourning woman and a grandfather holding a young female child. These figures represent the generation of sons, daughters, husbands and wives lost during the war. With outstretched hands the two adult figures form a V for victory. 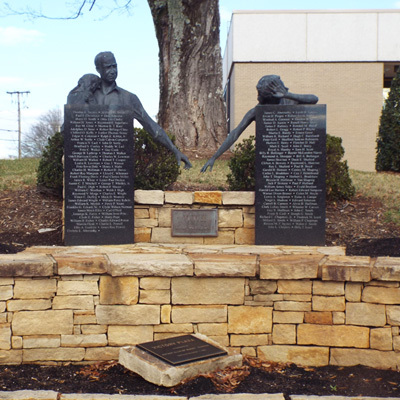 In front of these figures are two large pieces of black granite bearing the names of Burke County men and women who perished during the war. The memorial also has a life-size statue at the garden’s entrance titled “The Inductee” which represents the ideal youth, with hand raised to take the induction oath. On the stone wall running along the back side of the plaza are eight other bronze busts representing the branches of service and civilians important to the war effort; a textile worker, a nurse, a welder, a Coast Guard planner, a Navy Commander, an Army soldier, a wounded Marine and an African-American airman. Along the front of the plaza walkway are stone benches and columns with donor plaques attached. The wall, bench and column construction is best described as random sized squared stones laid in courses. The walkway directly in front of the centerpiece is of red brick. From this a ribbon of red memorial bricks winds its way along the plaza’s conglomerate concrete/pea gravel walkway. On the wall to the left of “The Inductee” statue is a flat sculptured piece, which reads “KILROY WAS HERE,” showing a bald-headed man with a prominent nose peeking over a wall being clutched with the fingers of each hand. The goal of artist Alex Hallmark was to honor both the military and civilian role in World War II and to portray the nation that went to war and the effects it had on its citizenry. The sculptor, Alex Hallmark, son of a career military parent, won an open competition to design the memorial. He also sculpted the Senator Sam Ervin, Jr. statue at the old Burke County Courthouse and the Doc Watson memorial in downtown Boone. The origins of “Kilroy was here” is unknown but it was a form of graffiti seen throughout World War II in American occupied areas. An engraving of Kilroy also appears on the World War II memorial in Washington, D.C. 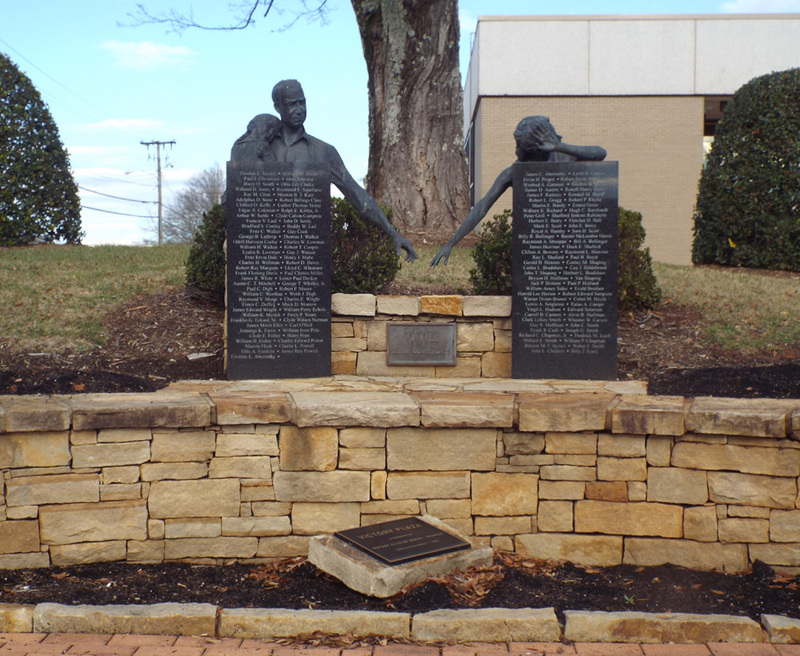 The memorial is located in front of and to the left of the Burke Country Courthouse at 201 South Green Street in Morganton, NC. To the right of the courthouse entrance is a Vietnam Memorial. The Law Enforcement Memorial is to the left of the entrance. Young and mature trees line the plaza area along with several varieties of landscape plants. The courthouse lawn rises up behind the rear plaza wall.